Celebrate At The George Observatory! Your child can blast off for fun on their birthday! Register for one of these exciting missions for kids 7 and up* and bring the cake to enjoy beautiful Brazos Bend State Park during the party. This unique hour-long program gives 7 to 9-year-olds the opportunity to fly into space. You must have one adult for every three children. 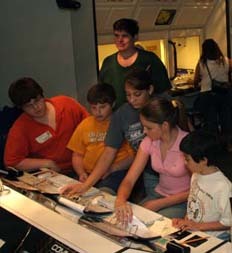 Students become astronauts operating the spacecraft on the one-hour expedition. Museum staff will operate Mission Control for the spacecraft. Your expedition fee includes the use of an indoor table for 1 hour. There are also covered pavilions for rent in the State Park for the entire day. $7 per person ages 12 and up. Chevron Expedition Center Missions are very realistic and children ages 6 and under have become upset during past parties.